Food, love, and a positive frame of mind. That is what I need. It’s what you need too. Maybe not in that order, and perhaps with some level of moderation, but they definitely feel like fundamentals to me. But trying to find that balancing act by which all three are satisfied at the same time can be a challenge. Having watched this movie last night though I am entirely certain that it is possible. The movie is a walking, talking, promotion for the food/love/positivity Club. And while I might have been sceptical before I am now a full time devotee. It is one of those movies where you can just sense the passion for the subject matter oozing through the screen. The food in the movie looks gorgeous and the intensity by which the actors relate their absorption in the dishes almost makes you think you can smell that Beef Bourguignon in the same room. Fantastic performances by all as well (I never say that). I honestly can’t catch one of them out. Amy Adams pulls off a great three-dimensional performance as Julie Powell. It would have been so easy to have just phoned this one in but yet what she produces is this brilliant portrayal of a bright, yet down, woman who is a catalogue of emotions and passions. Stanley Tucci is superb. He’s something of a favourite of mine at the moment as he continues to produce incredible performances no matter what role he takes (check out Lovely Bones). Here he manages to produce a character that’s subtle and restrained but still silently bursting with the most concentrated and delicious love for his wife. As a character he is supportive and affectionate – always there to support in the bad or laugh in the good. A lovely human being. And then there is Meryl Streep as Julia Child. I hadn’t even heard of Julia Childs before last night but I’ve got to tell you I love that woman. She has, in fact, made it onto my ever–so-exclusive fantasy dinner party list. And I wouldn’t even ask her to cook. I would just love to sit at that table and listen to that voice go. Streep always has this thing about her I can’t put my finger on. 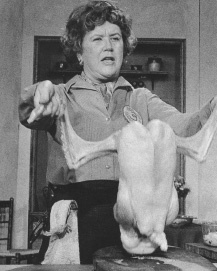 I mean who else could play Julia Childs with a hint of sexual allure and a twinkle in her eye? As Childs she is just magnetic to watch. The voice (I can’t get over the voice) at first makes you giggle but soon you find that it is just another medium of expression – another way of pushing out the pleasure Childs finds in France, in food, in the delightful ironies of general existence. She is a full on and paid-up member of the food/love/positivity Club, maybe even the President. Despite continuing problems in her life – infertility, a husband under investigation in McCarthyite America, publishing problem after publishing – she just pushes through and keeps on cooking. It’s a beautiful philosophy, particularly when you see how infectious it can become. In fact you don’t even need to see her. Just make her food as Julie does and you get that same peak of feeling. The only disappointment would be our view of Paris itself. So many external shots, apart from the odd introductory ‘Yes-this-is-paris-eiffel-tower-shot’, are close and fail to full acknowledge the environment that inspired her cooking and obvious love for the country. That’s a great shame because the rest of the film is just so sumptuous to watch. I just wonder why the same can not be said for city itself. That’s pretty minor though. This is a great movie and well worth a watch. I actually just ordered my girlfriend (a bigger fan of the movie than I am) a copy of Mastering the Art of French Cooking so that we too can become long time members to the stuffed duck, dribbling in butter, food/love/positivity Club ourselves.